A teaser image of ZTE's upcoming Axon 2 flagship was shared by the Chinese company's CEO Zeng Xuezhong on Weibo. 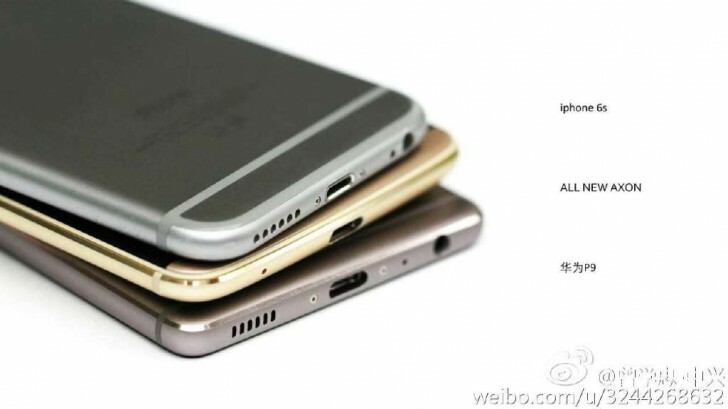 While the device's TENAA listing already revealed the front and the back of the device, the new teaser image focuses on the phone's bottom, and compares it with the bottom of the iPhone 6s and the Huawei P9. One can't help but notice the minimalistic design (sans any screws and speaker) that differentiates the Axon 2 from the other two flagship smartphones. However, it's worth mentioning that this design is not new to ZTE phones, as - for example - the Axon and Axon Elite also featured similar designs. As for specs, the TENAA listing revealed Snapdragon 820 SoC, 5.5" QHD OLED panel, 4GB/64GB memory configuration, and 20MP/8MP camera combo. The phone was also recently spotted listed on online retailer OppoMart's website carrying a $599 price tag.